Developed over the span of four years in collaboration with the world's top musicians, DJs and producers, the Crossfade LP headphones deliver epic sound with a distinct design composed of luxurious fabrics and lightweight metals. Crossfade LP are designed to be the ultimate multi-purpose headphone, and perform perfectly while on the move, at the gym or on stage. Crossfade LP features revolutionary 50mm Dual-Diaphragm High-Definition Drivers delivering multiple driver sound with the efficiency of a single driver. This means you get deep vibrant bass, organic mid-range and crystal clarity on portable devices. The driver's diaphragm is constructed of a harder inner ring providing an extended high range and a softer outer ring for deep lows, resulting in an unprecedented sound. Supple memory foam ear cushions isolate noise and immerse you into your own world of sound. With the Crossfade LP, you get a sophisticated headphone with a fantastic look. Constructed of lightweight metals and luxurious fabrics, the Crossfade LP is available in White Pearl, Phantom Chrome and Gunmetal Black. The Crossfade LP is equipped with a detachable cable, featuring a three-button remote control and high-fidelity microphone to easily change volume and answer or end phone calls. Crossfade LP is available for £199.99 from Carphone Warehouse stores and online, but we have five pairs up for grabs. 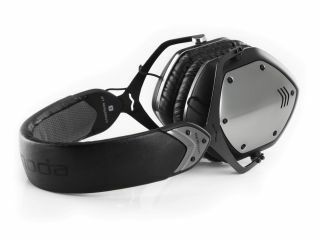 For more information, head over to v-moda.com. This competition is now closed. The winners are Vanessa Baker, Alan Martin, Adrian Johnson, Lewis Swift and Danny Metcalfe.